The island of Maui has one of the most scenic roads in Hawaii and is home to one of the largest dormant volcanoes in the world – Mt. Haleakala. Most people who visit Maui stay in the Kaanapali, Lahaina and Wailea areas, all located on the west shore of the island. 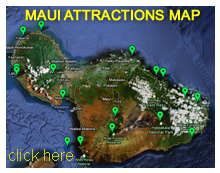 Maui attractions range from gorgeous natural sights like Iao Valley, the Hana coast, Haleakala National Park, rugged mountains, waterfalls and white- and black-sand beaches to man-made attractions, such as museums, night shows and temples. A Maui sightseeing tour can lead you from warm tropical beaches up to Haleakala at an elevation of 10,000 feet (3,048 m), where the temperature typically is around a chilly 40 F to 65 F (4.4 C to 18.3 C), but can even dip below the freezing point at anytime. Below is a list of some of the best things to do on Maui.